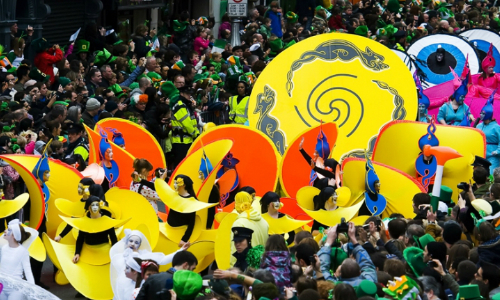 With this year’s St. Patrick’s Festival Parade set to be the biggest and most colourful yet. IFTN spoke with COCO Television’s Managing Director and Executive Producer, Stuart Switzer. Finding out about the logistics behind the production of the live broadcast coverage for RTÉ, on Ireland’s most celebrated Saint's Day. Des Cahill, Bláthnaid Ní Chofaigh and Aidan Power will be on RTÉ One from 12.15 for the broadcast as they take to the streets of Dublin for live coverage as the parade rolls through the heart of the capital. Talking about the set up and equipment being used to cover the Parade Stuart commented: “Set up wise this year we’ll have two stage positions, one on O’Connell Bridge and then a new second one which we are trying for the first time on Dame Street. The idea with the second stage area is to enable us to see a bit more of the city. “We’ll have ten camera’s set up in various spots and a 90 metre hoist on D’Olier Street which will give us our big scale coverage spanning across the city. TVM Television Mobiles based in Cork will be our OB and technical partners for the coverage. 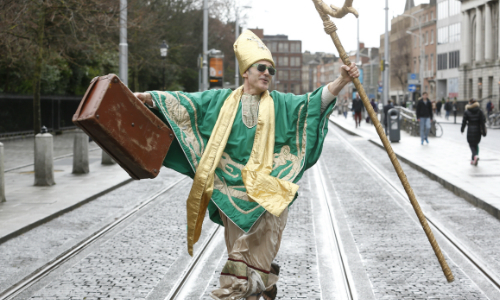 ‘Ireland You Are’ is the theme for this year’s festival parade and in the run up to the main event coverage, broadcaster Aidan Power will be immersed in all of the backstage colour and pageantry, while Blathnaid Ní Chofaigh and Des Cahill hold their perfect viewing positions on O’Connell Bridge. RTÉ Player will be bringing the festivities to audiences around the world. Available to watch worldwide for free, RTÉ Player will stream the St. Patrick’s Festival Parade live and on-demand for audiences at home and abroad. 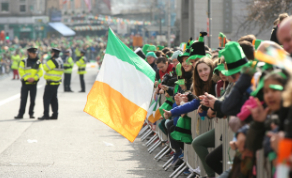 RTÉ Player will also show a special news report on St. Patrick's Day celebrations around the world, as well as regional parades from across Ireland and a collection of great Irish documentaries, food, comedy and Irish language programmes. So, wherever you are in the world, you can celebrate St. Patrick’s Day with RTÉ Player. It’s Friday, so that means that Ryan Tubridy will present another Late Late Show full of chat, music and entertainment with a nod to the day that's in it. Viewers will get a unique insight into the ancestry of some well known personalities, finding out, through DNA testing, what they’re made of and whether they have some unexpected cousins lurking in the family tree. It’s a busy day of sport and RTÉ will also be bring viewers live coverage of the Women’s 6 Nation’s Rugby decider between Ireland and England at 7.50pm (Kick-off 8.00pm) on RTÉ2. On RTÉ2, this will be followed by highlights of the AIB Club Finals at 10.15pm, as Ballyea take on Cuala in the Hurling Final and Slaughtneil face Dr Crokes in the Football Final. There will be lots to view and engage with across television, radio, online and mobile to bring you as close as you can get to what is another colourful and action-packed feast of parades, music, live sport and nostalgia as Irish people all over the world come together to celebrate all things Irish.